Ustica is a beautiful little island 37 miles north of Palermo, Sicily. The island of Ustica has been a Marine Reserve since 1986 which shows in the number and size of the fish here. It's a volcanic island with black larval rock: the name Ustica comes from the Latin for burnt. Diving is from May to October, with the opening and closing of the season being the quietest. Accommodation prices are also lower in May, June, September and October. Ustica has its own air ambulance service. Of Italy's three hyperbaric chambers two are on nearby Sicily. Make sure you have adequate insurance. Profondo Blu is owned and run by Paolo and Ann. Paolo is Italian and Ann Belgian: they speak Italian, English and Flemish. Profondo Blu is one of only two diving centres on the island to offer a covered hard boat. Open May until October. June, July and August are their busiest months. May or October is a good time to go as this is their quietest period. They are happy to go out even if there are only two divers. For 10 Euros non-divers can go on the boat - snorkelling whilst the divers are down or just relaxing on the sun deck. Profondo Blu also offer accommodation in a small resort with excellent food and wine. Lunch is on shore so you can choose just to do the morning or afternoon dive if you wish. The diving is very relaxed, in small groups according to experience. A very friendly, well-run, dive operation.. Highly recommended. "Hi Jill: my son Sammy and I just got back from a week at Profondo Blu, and really enjoyed it! Thanks so much for the recommendation. Even though it was the end of the season (we were the last guests before they closed), the diving was great and the weather more or less cooperated - we'll definitely go back. Anne and Paolo are brilliant, the small resort is pretty much every thing a diver could ask for, and the food, boat and service was great. We stayed at Visa Mare B&B in Palermo - literally across the street from the Ustica ferry. " "Diving center Orca are nice guys operating in a very professional mood. Prices are average for this destination. Two big RIB. Good value for money." 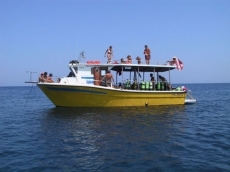 Mare Nostrum Diving started in Ustica in 1997, arranging dive safari liveaboards. Since 2005, a new boat changed the way of organising dive vacations, by offering full day diving and accommodation on land. A dive boat gives you the real freedom you need to experience on holiday. No hassling with equipment at each dive, diving when you feel to, have a siesta in the refreshing shadow, eating with your feet in the water, the sun on your back, next to a good glass of wine! The Linosa Sunshine Day Cruiser is a Dive Boat especially planned and equipped for divers. Length: 10,70 m, width: 4,10 m, sundeck, toilet, kitchen and fresh water. Full-Day Diving � min. 8 divers/ max. 14. Also the Dinghy "Gommone": no services, no shelter for single dives with up to 8 divers. Open June to September. Other periods only for groups on request. 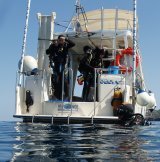 Guided dives can be organised in full day diving or half day, with about 2 or 3 dives per day and lunch on board if arranged. You can also choose to go for single dives. Groups are divided by level of licence and experience with about 6 divers per guide. Night dives, Deep dives and Nitrox on request. Dive Courses, Discovery programs, Scuba Review, Equipment rental. Snorkelling and sea-watching, boat tours and excursions. 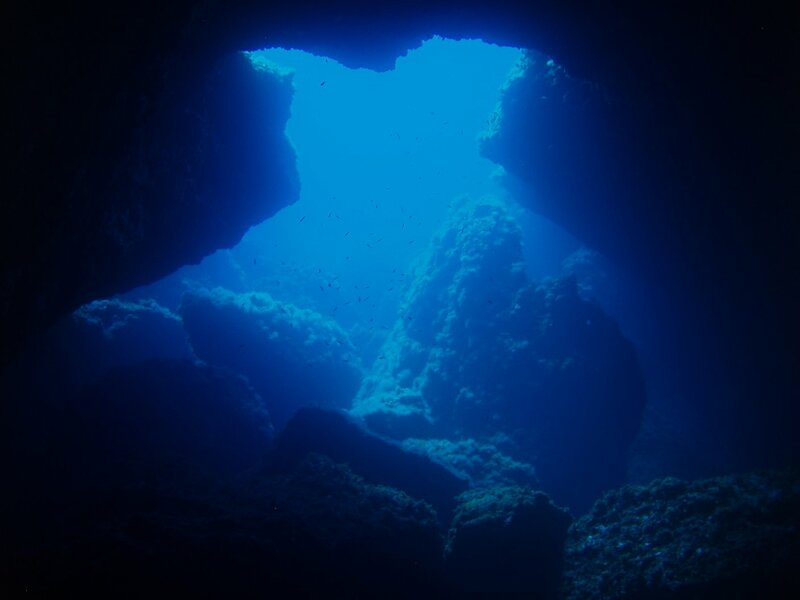 "A wonderful week was spent on Ustica diving wih Mare Nostrum. The two young guys running the dive centre, Danilo and Giuseppe, were a lot of fun but also very professional, and were excellent dive buddies. The diving was great, lots of life - octopus, tuna, lobsters, shrimp, morays... I could go on and on. Highly recomended." Offer PADI and ACUC courses. Leave the port of Cala S. Maria at 9.15 in the morning and at 15.15 in the afternoon. By Patrick Louisy. Covers 860 species with 1430 photos and 1400 drawings. This identification guide includes nearly all the marine fish you might see in coastal Western Europe and the Mediterranean up to 50 m depth. Please send your questions, or add your comments, on this page and diving in Ustica. Do you want to recommend a diving centre? Let us know. If recommending a diving centre, what connection do you have to them?